The Careers & Employability Service are organising some highly engaging networking events for current University of Plymouth students. Would you like to talk to professionals in your subject area about your options, or how their own career journeys developed? Our networking evenings provide a great opportunity to meet industry professionals, ask questions and build contacts. All with a free, tasty buffet dinner! Develop your skills: practise your networking technique with professionals, asking smart questions and selling yourself. Gain insight: find out from professionals about their jobs, roles, and their experience of the industry. Increase your confidence: chat with professionals from relevant sectors in a unique and supportive environment. Network with local and national employers: expand your network and explore opportunities in different sectors. Attending a networking evening will contribute three hours to the Plymouth Award in the Working Life category. Drop in to the Careers & Employability Hub in the Roland Levinsky Building to chat with someone from our team for more information on what’s on and how we can help you prepare for the event. Note for employers: if you are a professional or employer interested in attending the networking evening please email employers.careers@plymouth.ac.uk for further information. The Networking Evenings are sponsored by Santander. 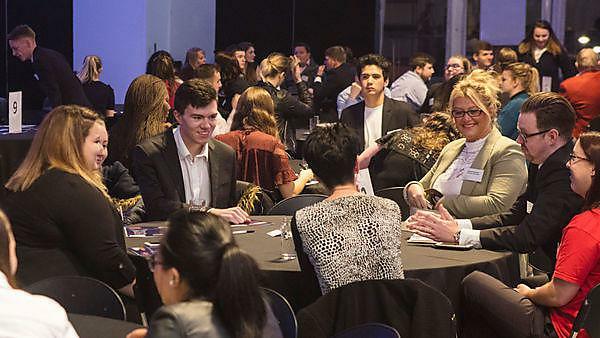 Our employer networking evenings provide students with the opportunity to develop and enhance their networking skills, a vital skill they will need for employment and business, with industry professionals.